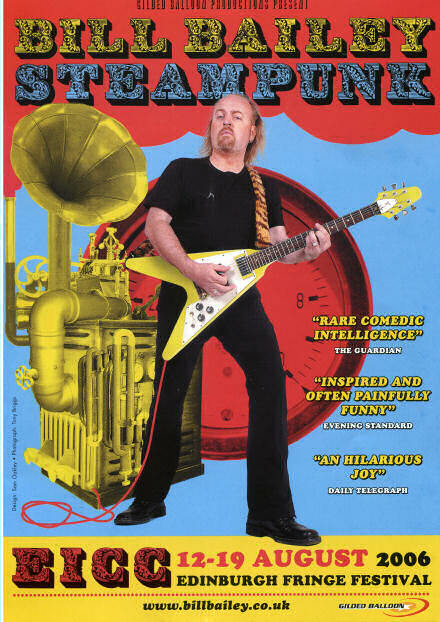 On Saturday night Jane and I got last-minute tickets (from a friend-of-a-friend) to Bill Bailey‘s Edinburgh Fringe show Steampunk. Sadly, it being the Fringe, the show only lasted for a few minutes over sixty before we were ushered out so that EICC staff could make ready the theatre for Jimmy Carr’s sixty-minutes performance. But not before we had heartily laughed our metaphorical socks off. The show ended with Bailey’s tribute to German band Kraftwerk: a Kraftwerk-style rendition of “the Hokey Kokey”, entitled “Das Hokey Kokey”. You could see it coming, right from the start of the show, as the lyrics are printed on the back page of the programme. But that didn’t distract from its comic genius. On the way into Edinburgh I read in Saturday’s The Scotsman an interview with Bill Bailey in which he talked about a recent 10-week stint in New York. His experience of working in a country where he is less well known, he said, changed the way that he approached performing. …before suddenly launching into some completely left-field topic and off he goes; Eddie Izzard does something similar. But New York, it seems, taught him the need to come out and hit the ground running. But what I liked most about the article was Bailey’s comment on what comedy is about, and about language play, and the beauty of language, and how language can be used efficiently and simply to encapsulate an idea. While he was [in New York], Bailey got slightly homesick and bought Elvis Costello’s When I Was Cruel, along with a Beth Orton CD. A big fan of Costello myself, I’ve noticed he’s popular among Bailey’s peers, notably Phill Jupitus and Jo Brand. Is the appeal his extraordinary use of language? I’m sure I can’t be the only person to notice the resemblance between the lank-haired, goateed, part-troll musical iconoclast and your good self. All BB really needs is a haircut, some spectacles, a scottish accent (presumably) and a dog-collar and the two of you will be revealed as the identical-twins-separated-at-birth you clearly are.